Kabobs have a long history and come in many shapes and sizes. Just about every cuisine has adopted them in some form or another and adapted them to their tastes and lifestyles. Shish kabob, döner kabob, and chapli kabob are just few of the many delicious varieties of this tasty dish. Kabobs are becoming increasingly popular throughout the world. With the rising demand for Mediterranean food in Los Angeles and Orange County, more Mediterranean restaurants are opening every day in cities like Anaheim. Often thought of as meat that is skewered, roasted, or grilled, and then served on a stick, the word kabob actually means “to roast” and can refer to any type of roasted meat, fish, or vegetables. They can be roasted on a skewer or on a rotisserie; the meat can be ground or chopped, spiced or marinated. It might be served in patties, sandwiches, or with rice. While kabobs have their roots in the Middle East, the practice of roasting and grilling meat probably goes back to ancient times. The word kabob is derived from Arabic, but became commonly used in Persian. With its origins in medieval Turkey and Persia, it has become a popular dish throughout Asia, Africa, and the Mediterranean. More recently, kabob dishes have become popular in Europe and North America. Each culture adds its own unique twist to the traditional dish. It is not surprising that Turkish cuisine features many different types of kabobs, given that they originated in this region. One popular type is the Adana kabob, from southeastern Turkey. It is spicy and made from ground meat grilled on a skewer over coals. Other popular varieties are the steam kabob, a meat stew prepared in a casserole dish with seasonings, onions, and garlic and the testi kabob, cooked in a sealed clay pot, which is broken open at the table. 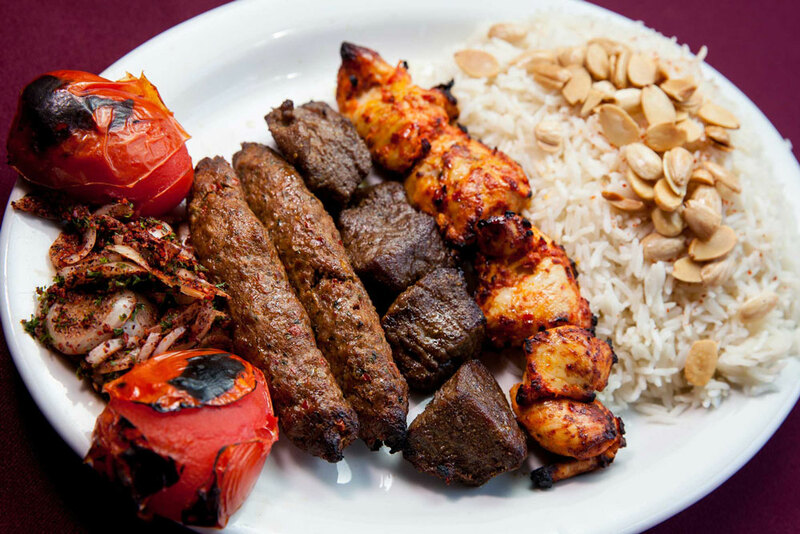 Persian cuisine also features many different and distinctive kabobs, and some of the tastiest kabobs in Orange County can be found in Persian restaurants. The most famous is the chelo-kabab, the national dish of Iran, made with mutton fillet grilled on a skewer and served with vegetables and spices. Another popular variety is the kabob koobideh made from ground meat mixed with parsley and onions. When served together with kabob barg, made from filet mignon, the dish is known as kabob soltani, or sultan’s kabob. Syria is famous for its kabobs which come in many varieties. The most popular one is the kofta kabob, consisting of lamb mixed with garlic and parsley, grilled, and served with vegetables. Several varieties of Syrian kabobs in Anaheim are available at Aleppo's Kitchen, where you can get homemade quality Middle Eastern and Mediterranean food in Orange County. Call now to reserve your table. The most common types of kabobs to westerners are the shish kabob and the döner kabob, and these are readily available in Middle Eastern and Turkish restaurants. Traditionally, shish kabobs are made from chunks of lamb cooked on metal skewers. The meat is marinated and spiced with assorted ingredients, such as lemon juice, yogurt, olive oil, and cinnamon. It can also be made with vegetables and cooked on wooden skewers. The döner kabob originated in Turkey in the nineteenth century and became popular in the West more recently. With the growing popularity of Mediterranean food, the döner kabob also can be found on many menus. The meat, usually lamb but sometimes chicken or beef, is stacked on a rotating spit and cooked gradually from the outside to the inside. It is sliced off and served in a sandwich or with salad. Pakistani cuisine, which combines cooking techniques from India, the Middle East, and the Far East, includes several varieties of kabobs, but the Seekh kabob is probably the most famous. Meat is marinated in Pakistani spices and then grilled and served with yogurt raita, chutney, or mint sauce. Another popular kabob in Pakistan is the Chapli kabob, a spiced meat patty. Kabobs have entered the cuisines of Africa as well. In South Africa, they are known as sosatle. The meat is marinated in a curry sauce and cooked on a skewer. In West Africa, it is called suya and consists of beef, ram, chicken, kidney, and/or liver, which is skewered, marinated, and grilled. In China, kabob is known as chuan or chuan’r and consists of small pieces of meat that are roasted or deep-fried. Usually they are made from lamb but they might also be made from other meats, seafood, insects, or exotic animals. In Japan, yakitori is a popular dish made from chicken that is skewered, grilled, and seasoned with salt, tare sauce, and other spices. As people from a variety of Middle Eastern countries such as Iran, Turkey, Lebanon, and Syria settled in the Greater Los Angeles area, they brought their traditional foods with them. This is why kabobs in Los Angeles are some of the best and most diverse. They are served in small, family-owned establishments, but also in more upscale and modern restaurants. Mediterranean food in Anaheim has also seen a renaissance lately, where many Mediterranean restaurants have opened in the last few years. These are just a few of the many varieties of kabobs available throughout the world. Each culture has given this classic dish its own flavors, spices, and methods of cooking, and the results are delicious to be sure, but the kabobs in Anaheim are among the tastiest. Check your Mediterranean or Middle Eastern local restaurant’s menu to see what type of kabob they have.